The full size Fouga Magister was designed over 60 years ago and in all that time (up to recently), it could not really inspire plastic scale kit manufacturers. Heller, a company from France, was interested in the Fouga and made two versions in the sixties, one in 1/40 scale and one in 1/100 scale (Cadet). Also in the sixties, Solido made one in 1/65 scale and Eko one in 1/150 scale. Later on, I finalised my scale line drawings for publication in the book Fouga Magister by Tine Soetaert and in the book CM 170R Magister in German Services by Gerhard Lang. Kinetic was the first to release a highly accurate 1/48 scale model based on my drawings, quickly followed by Wingman Models (reboxing of Kinetic with additional scale detail parts in two versions). The development section of both companies made use of my line drawings to create the model kit and to make the decal placement drawings. My compliments to the people at Wingman Models! This was soon followed by another highly accurate 1/48 scale model based on my drawings by Avantgarde Model Kits (AMK). I also supplied the decal artwork for the MT-35 and MT-48 versions from their kit. The model is extremely well detailed. My compliments to the people at AMK! Valom released a 1/72 version in 2014. I can't find evidence they used any of my data. Some things are curious about this reboxing. As mentioned, the plastic is still from the same moulds as the old one with the associated accuracy issues. The assembly instructions use the same poor drawings from the old kit. The decals on the other hand are a vast improvement. But the biggest surprise is the painting guide and the decal placement sheet. As opposed to the totally inadequate drawings from the old kit, you now receive very detailed and accurate line drawings of the full size aircraft (not the model inside unfortunately). Strange that Airfix suddenly goes through all this effort just for a reboxing. Or was this effort not so big and did Airfix find a less tedious way to make a large return on investment? Could it be their art supplier chose an easy route and derived his work from existing drawings? Anyway, it is a fact that their drawings bear an astonishing resemblance to my drawings, including the errors! Actually, I think I would have a good chance of winning if I were to sue them, so if anyone can give me good advice in this matter, that would be most welcome! Anyway, you can imagine I didn't appreciate the reply I got from Airfix. I feel that injustice was done to me, so I chose to give the opportunity for other people to have a look and judge for themselves by repeating the evidence sent to Airfix on this page. First, there is the illustration below. The top drawing is the original Airfix drawing, as published on their website, left untouched. The middle drawing is my original drawing in red lines and the bottom is the two drawings superimposed. Have you ever seen such a good match? Any very slight mismatch is probably due to the hastily executed retracing by the Airfix art supplier or due to the fact that the comparison drawing shows my original scale drawings (Belgian Air Force version) instead of the scale drawings from the book of Joe Maxwell (IAC version, based on my drawings) which were probably used as a "source of inspiration". Take a good look at the clear canopy area where no drawing ever succeeded in capturing the subtle combination of curves and straight sections. Isn't it an extraordinary coincidence that it matches my drawings while it doesn't match the kit clear canopy or any other published drawing at all? I used my own measured data for the clear canopy area, as well as for the engine nacelles, the panel lines, the landing gear, the ventral strake, the details etc. These are my personal interpretation and I know that they are not 100% correct (no drawing is ever 100% correct), but all this is copied on the drawing above and also on the decal placement drawings inside the box, including the errors (more details further on). Why on earth would the art supplier go through the time and trouble of getting that area right when there is absolutely no need for a correct clear canopy representation in a colour scheme or in a decal placement drawing? It's even more striking to discover that the Airfix drawing does indeed match mine, but it doesn't match the kit parts! Look at the photograph below of the Airfix Fouga drawing and the actual plastic fuselage half from the box. And we see all this again on the decal placement drawings inside the Airfix box. Again, why does the shape on the Airfix drawings match my drawings almost perfectly but seriously mismatches the kit? Same question for the position of panel lines and details? There are plenty of panel lines and details which are shown on the decal placement drawings but are not visible on the kit parts or mismatch these, while they match my original scale drawings almost perfectly. What could be the reason for that other than they were copied? 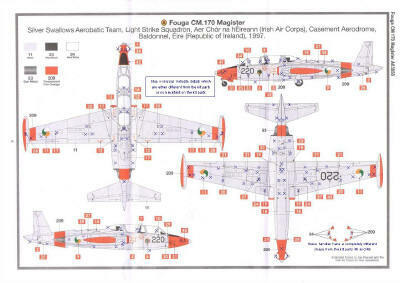 I have counted over 130 (one hundred thirty) of these, see drawing of the Airfix IAC decal placement sheet below with those details shown in blue. If even the errors I made on my drawings (and the ones from the additions for the Joe Maxwell book) are copied, how can one not suspect the Airfix artwork supplier to have used my drawings as a base? There are a handful of these errors and they are all there, "faithfully" copied… Further below is the side view of the Belgian Air Force version (as published on the Airfix website) with all these errors pointed out in blue. Why would an artwork supplier retain the old and rather primitive assembly drawings (including a major error), but go through the trouble of providing extremely detailed decal placement drawings which do not match the kit? Could the reason be that it was just an easy task to derive the work from my drawings, offering Airfix the chance of an inexpensive but flashy upgrade to an otherwise outdated kit?